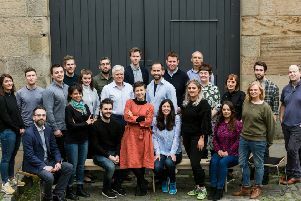 NOW at the half-way stage of its initial five-year funding life, Censis is into what chief executive Ian Reid describes as the organisation’s “teenage years” – moving beyond the start-up phase into the full flow of driving economic activity in Scotland’s £2.5 billion sensor and imaging systems industry. For the majority of adolescents, coming of age entails increased self- sufficiency, and Censis is no different in this respect. With an initial £10 million of funding from the public purse due to run out early in 2018, discussions about what happens after that are getting under way. “We are now starting to build models of sustainability,” says Reid, who took over at Censis in May of last year. This will most certainly involve some variation of the so-called “Fraunhofer Model”, where one-third of the organisation’s budget is publicly funded through existing backers such as the Government’s Scottish Funding Council, Scottish Enterprise and Highlands & Islands Enterprise. The remainder comes from a roughly equal split of private sector work and competitively-won contracts for government- sponsored research. “Nothing is off the table,” Reid says. “There is a debate to be had with our current funders, and perhaps other funders, but we are very keen to have an industrial element. With a successful international career spanning research, engineering, operations and business development already under his belt, Reid should know what the private sector values. His role as the head of Censis – the Scottish Centre for Sensors and Imaging Systems – is to help extract those profitable nuggets from the realms of academia for the benefit of industrial growth. A native of Wales, Reid spent a brief period as a research assistant after earning his MSc in physics at Aberystwyth University. He then landed a job in the semiconductor unit of the former Hirst Research Centre run by GEC. The Hirst closed down in the early 1990s after GEC largely withdrew from serious industrial research, but Reid was long gone by that time, having worked his way through various positions with Marconi, Pulse Engineering, Rood Technology and QinetiQ, the defence technology company privatised by the UK government in 2001. He spent nearly a decade at the latter, where he finished as head of the aerospace division employing nearly 800 people with £90m in turnover. With a background in science, Reid grew accustomed during his career to understanding every aspect of the technology he works with. That changed at QinetiQ, where most of the scientific staff “had forgotten more than I will ever know”. He eventually decided to take a break from the full-time executive treadmill, and spent nearly four years as a consultant interim manager within companies facing hurdles such as a new product launch or succession issues. The chance to head up Censis lured Reid back into full-time management, in large part because of the “exciting opportunities” within Scotland’s sensor and imaging sector. There are about 170 companies in Scotland with a focus on sensors and imaging systems, a key area of technology for sectors ranging from agriculture, food and drink to defence, life sciences and transport. Censis acts a single point of contact for these firms when accessing academic research and innovation across Scottish universities and institutions. In an effort to maximise its impact, the organisation is targeting its efforts on specific high-growth sub-sectors in which Scotland is well-represented and has distinct advantages. These include sub-sea applications for the new wave of renewable energy devices; environmental monitoring in sparsely-populated rural areas; the oil and gas sector; bio-monitoring for medical devices; and general manufacturing applications, with a particular focus on the food and drink industry. Censis is also looking to assist small and medium-sized firms in the field of the “internet of things” (IoT) through next month’s launch of the Connected Device Development Centre (CDDC). Operating as a “lending library” of internet-connected devices, the CDDC, located in the Censis offices in Glasgow, aims to cut the time from product concept to prototype to “a fraction” of what is normally required. The global IoT market is expected to double between now and 2018, as everything from home appliances and cars to farm animals and offshore oil rigs become wirelessly linked for remote data exchange, improving the efficiency and accuracy of their management. “What we are looking for is developers to come in and try out new technologies, but that is only the tip of the iceberg,” Reid says. What makes you angry: People not trying, and talented people squandering their talent.